Everyone is on the internet these days browsing memes, reading posts, and just finding some way to kill time. This is the perfect time to create your own personal blog! What better time to do that then now? Creating a blog has never been easier and we wrote this guide just to show you how easy it actually is. Here are the the 5 steps to getting your WordPress site up and running in a matter of minutes. Your domain name is an important aspect of every website and personal blog. The easier it is to remember, the more people will come back to your site. Try to be creative and to the point. 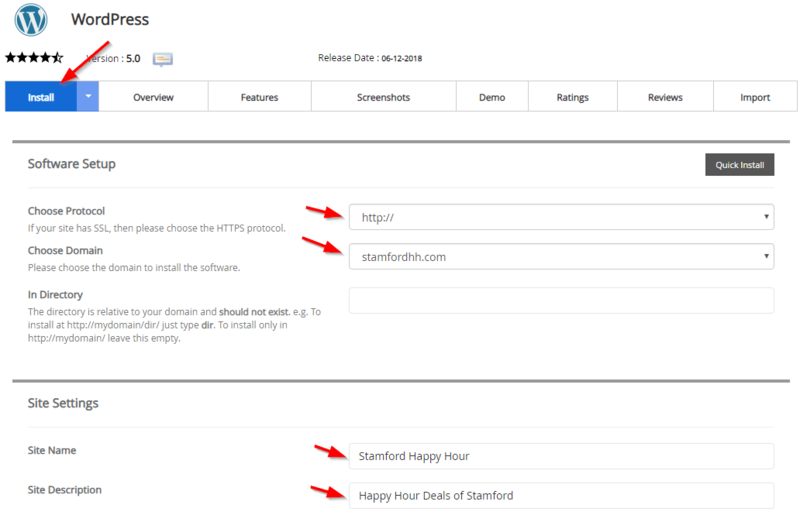 For example, if your blog is about happy hours in Stamford your website could be StamfordHH.com. Simple navigate over to our Register Domain search tool and you can see what domains are available. If your desired domain name is not available just look below at the Suggested Domains area for even more ideas. Now it’s time to select your WordPress Hosting Plan. We have absolutely killer plans for hosting your WordPress sites and blogs. Our packages start off with the most affordable plans limiting you to 1 website, limited storage and accounts, but quickly escalate to unlimited plans and faster services. If you’re just starting out and only need to host one website, then our Lucky One package would suit you beautifully. 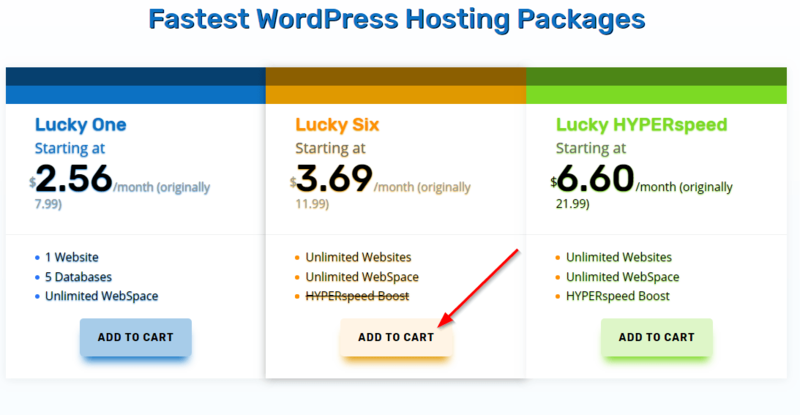 If you want unlimited storage, bandwidth, and a HYPERspeed boost to make your content delivery as fast as possible you could go for the Lucky HYPERspeed package. Our WordPress Hosting plans can be found here and if you’re looking for something even more affording you can check out our Dollar Hosting options. Now simply select your plan, enter your new domain name (or existing domain if you plan to just update your hosting plan), and hit continue. You now can choose your billing cycle and configure other available options. Discounts will be applied during checkout and you should also remember that the longer the term, the greater the discount. 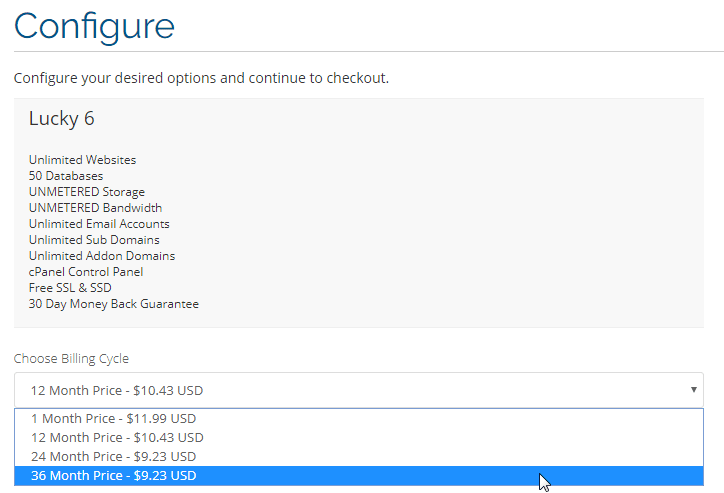 Next just enter your billing information on the checkout page and submit your order! You will receive a confirmation email and your hosting account will be setup in minutes. Installing WordPress is incredibly easy to do and only takes a few minutes. Once you receive your order email, you will navigate to your cPanel dashboard (usually ServerIP:2083 or YourWebsite:2083). 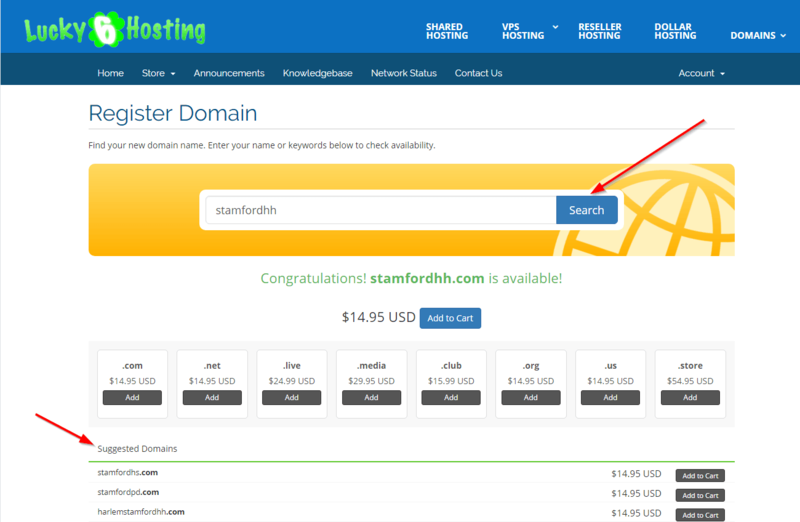 For this example we would navigate to https://stamfordhh.com:2083 and login with the credentials provided in the welcome email. 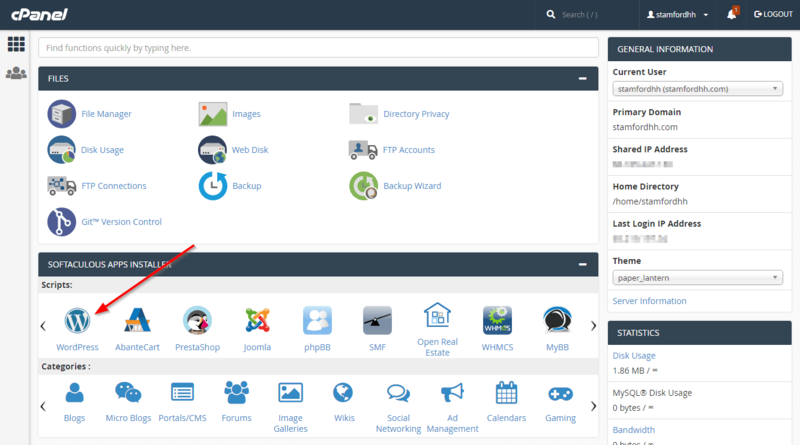 Once you are viewing your cPanel dashboard, you will see the section named “Softaculous Apps Installer”. Simply click on the “WordPress” icon and the Software Setup screen will come up. You can leave your Protocol and Domain as the default value and just update the Site Name and Site Description. Don’t worry, these settings can be updated later as well. Fill out the rest of the required fields on the page, click on Install, and you’re ready to go! Login to your WordPress backend by following the setup email that was sent to you after your installation or by going to http://Yoursite.com/wp-admin and entering your username and password. Once logged in, the first thing I would recommend doing is selecting a Theme to work with. Under the Appearance option on the left menu, select Themes and you can browse through thousands of themes and choose one to your liking. Then simply activate your theme and we’re off to the races. 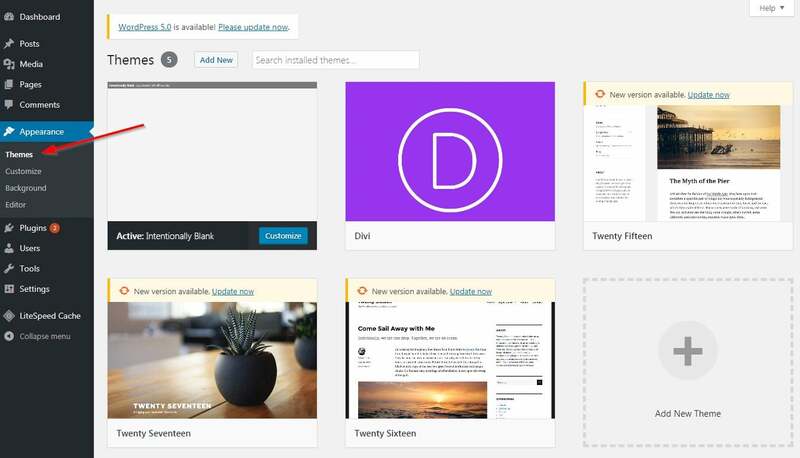 Check out some of the best themes and tools to help you design your website at Elegant Themes. Once your select theme is activated, you want to customize it and set your static content such as Headers, Footers, Menus, and Sidebars. To do this go to the Appearance section on the left menu bar and select Customize. You can go with the standard setup and only adjust the text, or you can completely customize every aspect of your site. The options are endless and the power lies in your hands! Once you have this all setup its time to publish your first post! The great thing about WordPress is that it makes it very easy to publish your blog posts. Navigate to Posts on the left-hand side and click on Add New. Enter the Title and Content below that and you’re ready to go! You can save it as a draft and finish later, preview your post, or just publish it straight away. And just like that, you have your WordPress site up and running in a matter of minutes! Now, of course this is just a basic guide to get you started as fast as possible, but the possibilities are endless. There are thousands of available plugins, themes, and guides out there to help out in case you ever get jammed up and need assistance. Our support team is standing by to help with any issues as well via our support ticket system or our live chat. And always remember, Post it and they will come! We hope this guide was informative and helpful and encourage reach out to us with any questions, comments or concerns! We’d love to hear from you. So until next time, happy blogging.